I’m looking for easy, quick, inexpensive craft projects … least-effort-for-maximum-impact. I’d been thinking about teacup candles for a couple of months, browsing through the odd online tutorial, mostly coveting all that vintage china and moody lighting potential. 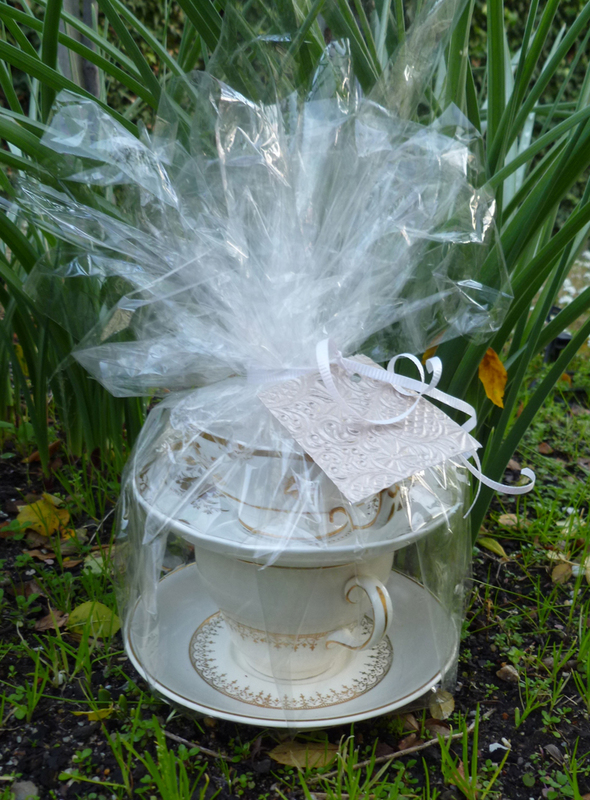 A few weeks ago an invitation arrived for my niece S’s 25th birthday celebration – a tea party, a leisurely afternoon of sipping tea and nibbling ribbon sandwiches. S had stipulated no presents but a hand-crafted-from-recycled-materials-Auntie-type-gift would surely get me around that? 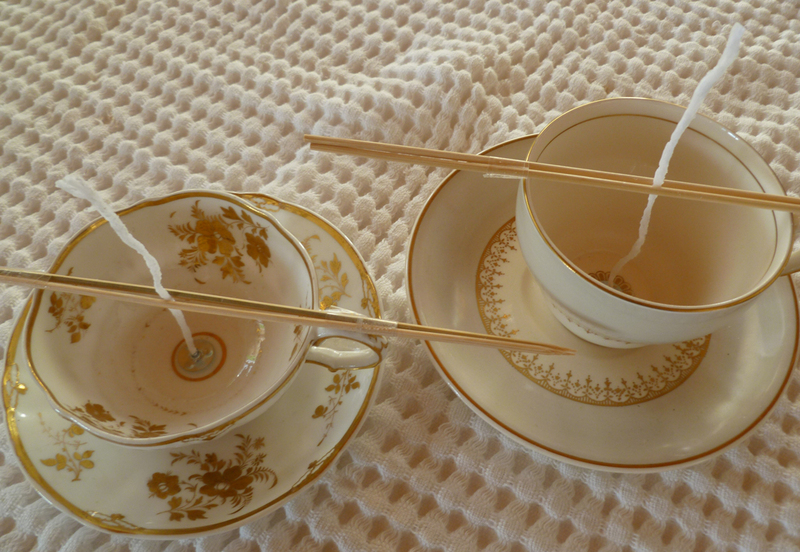 I picked up these two gold-toned vintage china duos at the Ballarat Trash and Trivia Market. 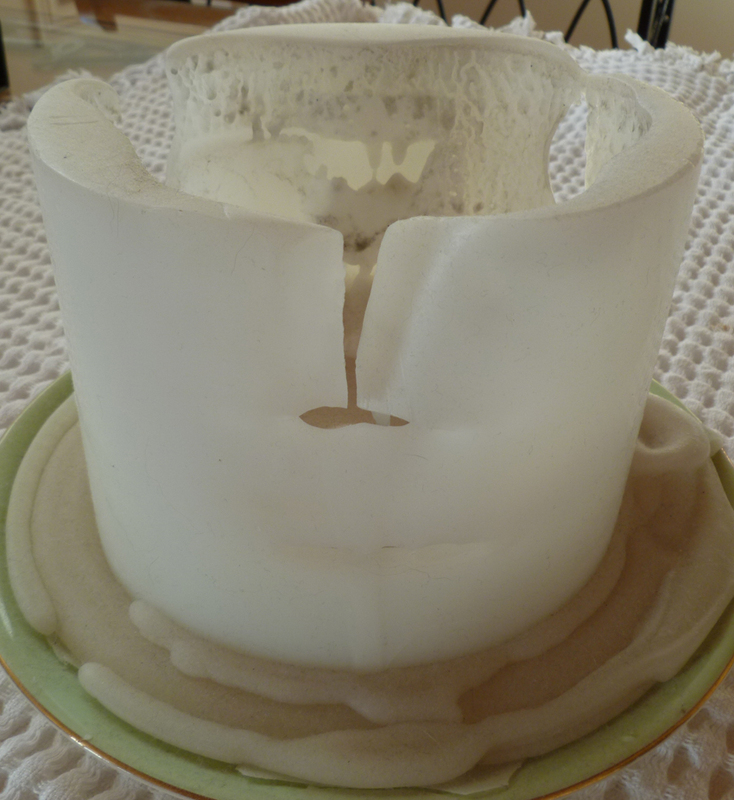 I had already decided to upcycle the remnants of this HUGE triple-wicked candle that Mr P had souvenired from the props department on one of his TV commercial shoots. It’s seen us through several late-night soirees on the deck but its time has come. I searched and sought up and down the aisles, eventually finding what seemed like the solo staffer – she was behind the jump, tapping away on a computer keyboard. I explained what I was after. “If it’s not in the computer, we don’t have it,” she rebutted, eyeing my vegie-laden shopping trolley suspiciously. There was no offer of where I might head to find what I needed. No alternative. No plan B. So this is what they mean by bricks and mortar retailing … a brick wall. No wonder it’s in its death throws. Once again, I found myself at the crappy end of crafting … where I don’t really know what I’m doing, I don’t have what I need (don’t even really KNOW what I need) and am not sure what to do with what I need when I do eventually get it. This is when I often throw crappy, half-baked craft projects into the bottom of the spare room wardrobe, never to see the light of day again. I phoned the OTHER BIG craft store (an even braver move, because this one is a MEGA-store) to check their stocks. Unfortunately, there was a gaping crevasse between the promise of the phone conversation and the reality of the instore experience. Floor-to-ceiling racks of stock but few staff to help me explore it. In time, I located a customer service desk and was directed four aisles down, where I found nothing wicky or waxy. I found the googly eyes alongside curly polyester hair extensions for dollies and tiny wire spectacles (presumably for those googly eyes). But nothing waxy or wicky. I braved (yes, braved) the counter and asked the staffer to show me. She was right … beside the googly eyes and hidden BEHIND the tiny wire spectacles was a single row of packaged wick and a solitary packet of wick holders. “Is that all you have?” I queried. “We also have these,” she offered, in the next aisle. 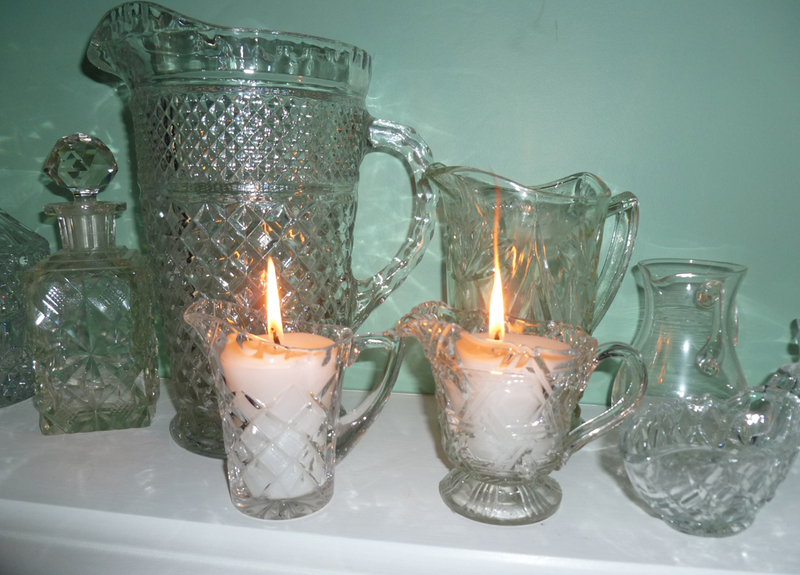 “These” were kits for making tealight candles. Do folk actually make tealight candles? I knew right then, that I wasn’t going to get the advice I needed here. This wasn’t customer service. There was no generosity of spirit. No choice. No smile. No apology. No empathy. This was modern retailing at its worst. Without specialist advice from someone who knows his/her stuff, I might as well buy online. I should have left myself a wider window. I grabbed what the MEGA-store thought I needed and headed for Google. Google came through for me (doesn’t it always?) 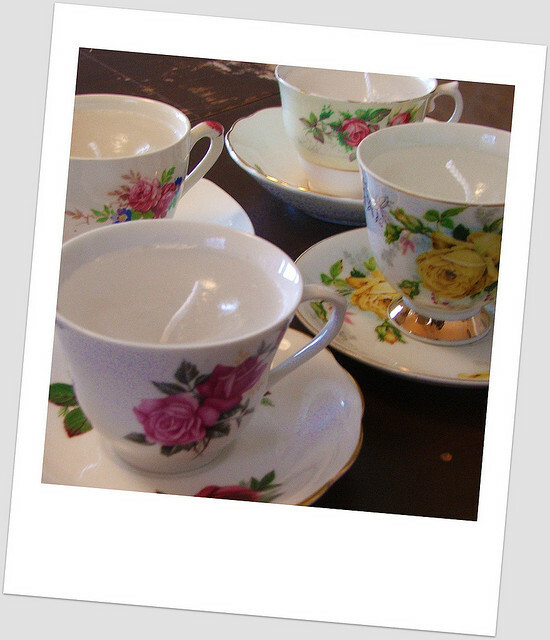 with a brilliant choice of bloggers and videographers sharing their tips and specialist advice on making teacup candles. Next time, I’m going online-all-the-way, including buying my materials, so I sidestep that crappy end of crafting all together. The end of the tale? I didn’t get my craft on in time for the tea party (that was entirely my own fault). I grabbed some gorgeous flowers for my niece and had a fun afternoon sipping tea and nibbling ribbon sandwiches. 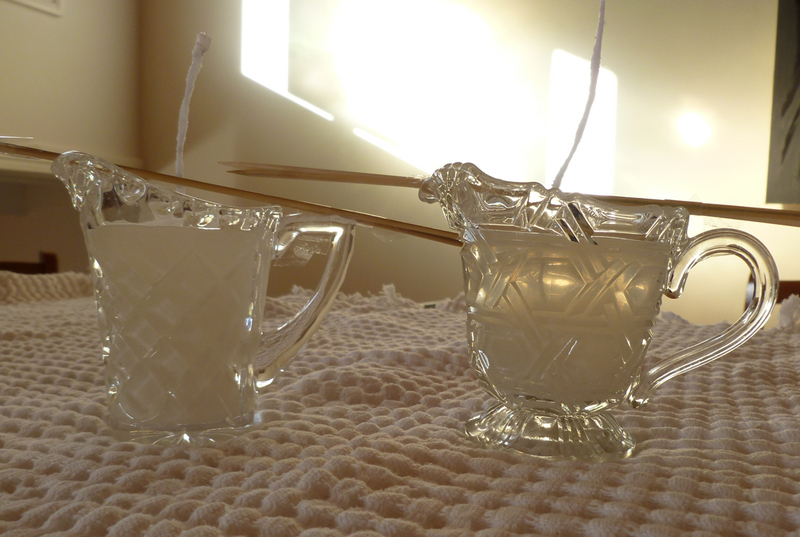 Chopped some wax off that BIG old candle and melted it in nested saucepans (I used old ones, including a fave vintage glass Pyrex one). I used two bamboo skewers taped together to secure each wick in the centre of its cup. Next time I catch up with my niece S, I have a lovely present for her, achieved in the most part with the help of Google and the blogosphere. (I’m even guessing she might read about it here first, which would be quite fitting). That’s the brilliant, non-crappy end of crafting that makes it all worthwhile … giving. Previous Post What would MacGyver do? Help or hike it? The crystal jugs look gorgeous also.